This is the famous Archaeopteryx fossil displayed in the Museum für Naturkunde in Berlin, Germany. 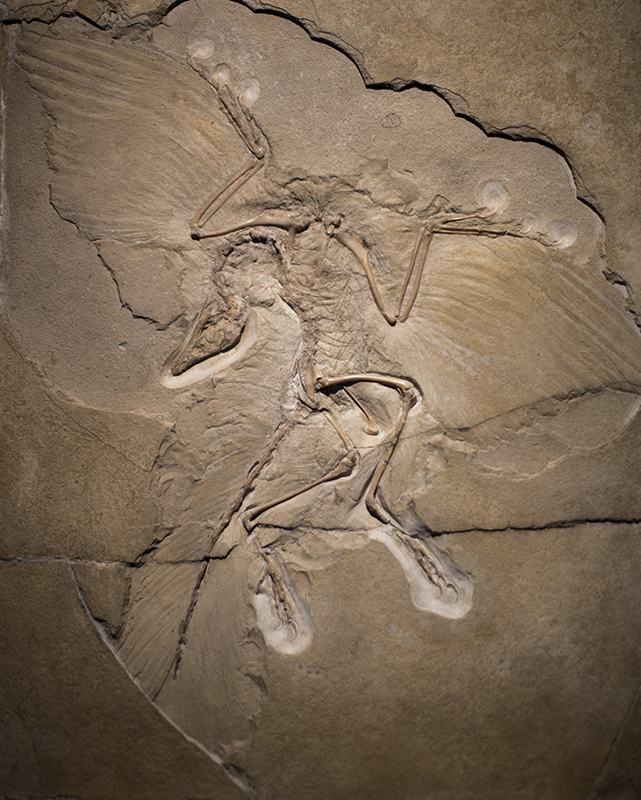 This particular sample was found in the Solnhofen limestone formation in Bavaria and is the basis for the link between the dinosaurs and the feathered birds. Archaeopteryx itself is a feathered theropod, but is thought of as the oldest documented bird dating back approximately 150 million years ago. The fossil was found in 1874 by Jakob Niemeyer who traded it to Johann Dorr for a cow. Johann then sold the fossil to Ernst Haberlein for 2,000 German Marks. This sale was then turned around to the founder of Siemens, Werner von Siemens for 20,000 German Marks for the University of Berlin which has provided this specimen to scientists around the world as the best preserved specimen found with elegant feathers and an exquisitely preserved skull. As a biologist, seeing this fossil represents something of a pilgrimage. Its a journey that all biologists would benefit from making as the Museum für Naturkunde is a phenomenal place that will get a blog entry all by itself when I have time to make the entry. 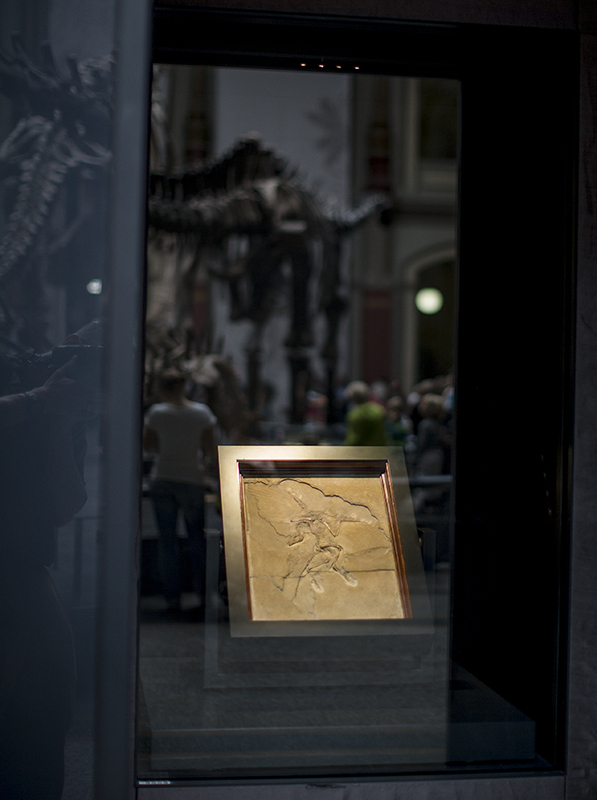 Note: Archaeopteryx specimen displayed at the Museum für Naturkunde in Berlin. These images of the archaeopteryx are Wikimedia Commons licensed to share and remix under the following conditions: 1) attribution, and share alike. Linked on BoingBoing: Archaeopteryx (photo). I wonder if the German expression “Kuhhandel” goes back to this trade. A cow-trade indeed. Hope it was at least a good cow. Ha! Really good question. I wish I knew the answer. Thanks for providing the full resolution. It’s an iconic fossil that is a worthy inclusion in everybody’s personal image archive. Happy to oblige in this case. But the right wing is cut off. Aren’t several of the displayed specimens actually casts instead of the actual fossil? I don’t know about that. From what I’ve been told that may be true. I have no way of knowing that without doing some digging. Thanks for the tip-off, Bryan! I made it to see Archy the next day, before my flight out! It was truly a pilgrimage that I could not have left Berlin without making. Now, I have to take my quite envious daughter to see Archy… and for me to see the rest of that superb museum! Thanks Michael. It was a pleasure to run into you in Berlin. Wonder where we’ll run into each other next?